Concord, N.H. — It was, in some ways, an incongruous scene: Pete Buttigieg, the 37-year-old Democratic presidential hopeful running on a message of generational change, addressing a crowd that was overwhelmingly white and overwhelmingly white-haired. 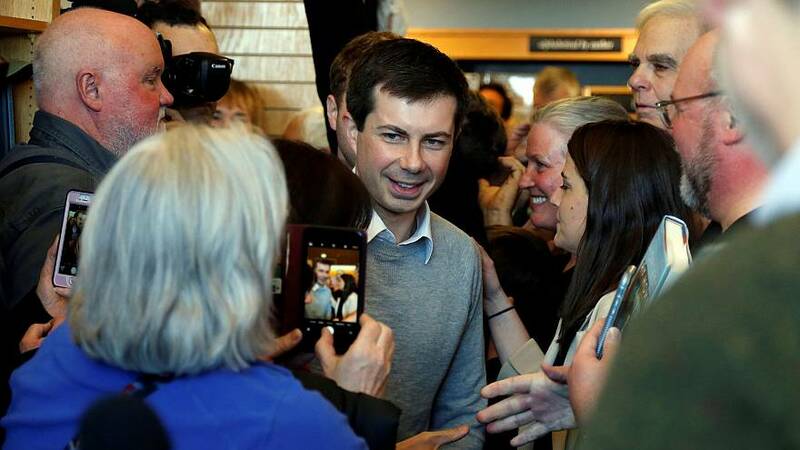 But if Buttigieg's two-day campaign swing through the first in the nation primary state is any indication, many Democratic activists are drawn to the South Bend, Indiana, mayor's message and don't see his age as a liability. Indeed, many view it as an asset. "It's time for a new generation of people. I'm almost 70, we need to sit back a little bit," said Jeanie Crocket, who traveled from nearby Lawrence, Massachusetts, to see Buttigieg at a campaign event here. Manchester, New Hampshire, resident Mary Woods added, "I don't think age means you have wisdom or integrity. Look and what we're facing in Washington now." Among more than a dozen Democrats eyeing the party's presidential nomination, Buttigieg in recent weeks has broken through as a candidate on the rise: a Harvard educated Rhodes Scholar, military veteran, openly gay and by far the youngest in a highly diverse field. In campaign appearances, he speaks proudly of his husband and his deployment to Afghanistan. But even he seems to realize his age might be a tougher sell. "I recognize that it's perhaps a little bit less than traditional to have a 30-something Midwestern mayor entering into a conversation about the highest office in the land. I get the audacity," he told several hundred people jammed into a bookstore event Saturday morning. "But I also believe we are in a moment that calls for greater change than we've seen in a long time." Buttigieg's pitch, which he calls "intergenerational," warns of a future in crisis if certain issues aren't addressed, notably cybersecurity and climate change. In the 2016 New Hampshire primary, Democrats overwhelmingly favored Vermont Sen. Bernie Sanders who, at 77, is seeking the nomination again this time. In conversations here, many activists spoke fondly of Sanders and former Vice President Joe Biden, 76, who seems likely to enter the race soon. Polls indicate both men are leading the large Democratic field. But many said they worried both men represented the past and that they were eyeing a younger candidate to take on the 72-year-old President Donald Trump. "I was a big Bernie guy last time around, and Bernie should get a lot of kudos since he laid the platform for what the Democrats are talking about today," Nashua resident Bruce Nest said. "But this guy, Pete, brings it to a whole other level. Bernie is like high school, Pete is like college." Manchester resident Anne McDonough put it more bluntly: "I think Bernie's time has passed. Also, Joe Biden's time has passed." Buttigieg, for his part, coyly sidestepped the question of whether Sanders or Biden were past their prime. "My hope is my personal combination of energy, education and experience will be right for this role," he told reporters. "I've seen very energetic people who are twice my age and I've seen sluggish people who are younger than I am. It's a competition of individuals, as it should be."